Following EPA’s proposal to implement regulations forcing coal power plants to reduce emissions, EPA Administrator Gina McCarthy announced that her agency would be holding eleven public listening sessions around the country to discuss EPA’s plans and to receive feedback from the public (Atlanta, GA, Boston, MA, Chicago, IL, Dallas, TX, Denver, CO, Lenexa, KS, New York, NY, Philadelphia, PA, San Francisco, CA, Seattle, WA, Washington, DC). Coal power plant operators have repeatedly said these regulatory standards cannot be met without either adopting a technology (carbon capture ans sequestration) that doesn’t yet exist, or switching to another fuel. Notably, only one meeting is being held in a city located in a state ranked in the top ten coal producing state. It would seem the administration has no intention of promoting legitimate debate as it excludes the very people who are affected most by these regulations. Congress is outraged by the omission of impacted states from EPA’s listening tour destinations. Last Friday, 41 House representatives sent a letter to the EPA demanding to know why the proposed meeting sessions are not in the regions they affect. These closed and existing power plants are not located in any of the areas you are holding these listening sessions. In all fairness, residents and businesses in rural areas deserve to be heard just as much. There’s a simple reason EPA would prefer to not listen to people from coal-reliant regions: The agency’s regulations threaten jobs for no purpose, other than the placation of a special interest. 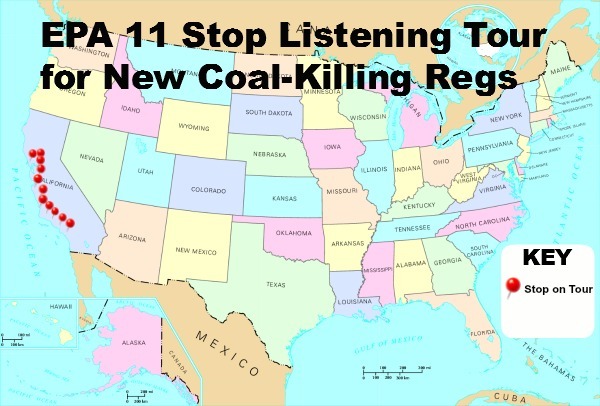 If the administration is sincere about addressing the concerns of the public, they should be holding these public listening sessions in cities located in states with the highest coal production such as Charleston, Cheyenne, Frankfort, Harrisburg, and Helena. These are the cities most accessible to people affected by the regulations and where people stand the greatest risk to lose their entire way of life.